The first thing you need to do is to find out what arrangements you currently have in place. This could involve talking to your current and previous employers to see what workplace pensions you might have. Also, if you have any kind of personal pension, then it would be good to check how this is performing. Some companies – like PensionBee – let you combine all your work pensions into one new fund, which might make things a little easier to understand. The next tip would be to decide on what kind of lifestyle you would like to have during retirement. Try to be realistic. If you’re late to pension saving then it simply might not be possible to have a lavish lifestyle in retirement. But that doesn’t mean that you have to settle for life being a struggle either. When you’ve made a decision as to what kind of lifestyle you want during retirement, you can then work out how much you’re going to need to contribute towards a pension to attain it. An easy way to do this would be to make use of an online pension calculator*. After you know how much you’re going to need to put away to have the retirement you want, it will then be time to choose a pension provider or plan. If you feel you are pretty clued up financially then you may feel comfortable choosing one yourself. To go down this route it would be good to do as much research as you can. Make use of free online investment guides* and also look at the reviews people have given to the pension companies you are considering. If you’re a little nervous, however, then it might be best to seek some advice. You could do this by finding a local independent financial advisor* or by making use of any free advice offered by the government. Finally, try to remember that sorting out your pension isn’t a one time event. There are many things that will happen in life that could mean that you need to review your pension arrangements. If you don’t have a professional advisor looking after your pension for you, then it makes sense to review your pension regularly. This will ensure that you are still going to meet your goals. 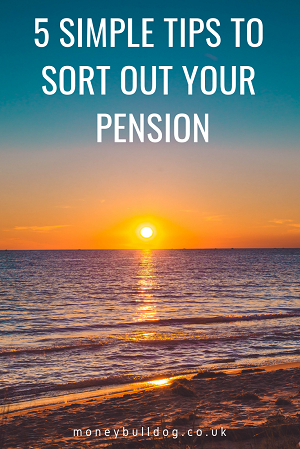 So, if you are feeling daunted by the thought of sorting out a pension, keep calm. Start with the easy steps mentioned above and then go from there. It will be well worth the time and effort getting it sorted now, rather then regretting it later in life. Don’t get scammed out of your Pension Savings!